Catalog > Ginny Custom-Dressed "Forever Blooms"
Simply precious custom-dressed vintage reproduction Ginny doll we call "Forever Blooms" has a tosca flip, brown eyes, and rosy cheeks. She's dressed in a one-of-a-kind designer vintage-style outfit made of a garden floral print hanky dress with lace butterfly sleeves and a skirt with scalloped edges accented with lace trim and mini rosettes. The back is an open-style showing the white organdy/nylon petticoat trimmed in lace. Underneath are matching white nylon/organdy bloomers, white cotton socks and new lavender side-button shoes. On her hair is a vintage Ginny-style lavender bow. 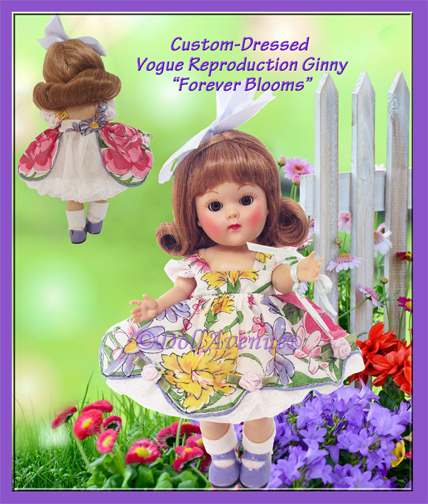 An exquisite outfit and doll whose price reflects the quality and cost that went into the design of this one-of-a-kind Ginny! These vintage reproductions are now hard to come by and this is your chance to own a one-of-a-kind little darling! Ginny with arrive in MINT condition in a Ginny box with a custom label.